Who doesn’t love a beautiful wedding? Sisters Anna and Lizzie Post do, and they tell us how to do it right in the sixth edition of Emily Post’s Wedding Etiquette — Emily being their great-great-grandmother. The Burlington-based Emily Post Institute continues to provide us with proper-behavior info for that special day (and all days, really). That includes manners for the guests before, during and after the ceremony. In the new edition, the Post sisters set forth etiquette guidelines for a rapidly changing, high-tech, social-media-savvy world. The love game has certainly changed since Emily Post’s time, as we saw this year in Spike Jonze’s Academy Award-nominated film Her, where a man falls in love with the voice of his operating system. It’s easy to feel compassion for Joaquin Phoenix’s character, who yearns to have a witness to his life without the demands of commitment and human intimacy. We humans naturally have the impulse to share our lives with others. And new technology has brought immediate gratification to a whole new level — whether on Facebook, Twitter, Instagram, Snapchat, Pinterest or something invented five minutes ago. To some, the idea of prohibiting smartphone use at a wedding may seem unimaginable. Yet there’s something to be said for digitally disconnecting to better connect personally — especially with your friends or relatives on their wedding day. Anna Post shares with Seven Days why it’s crucial to understand social-media etiquette. 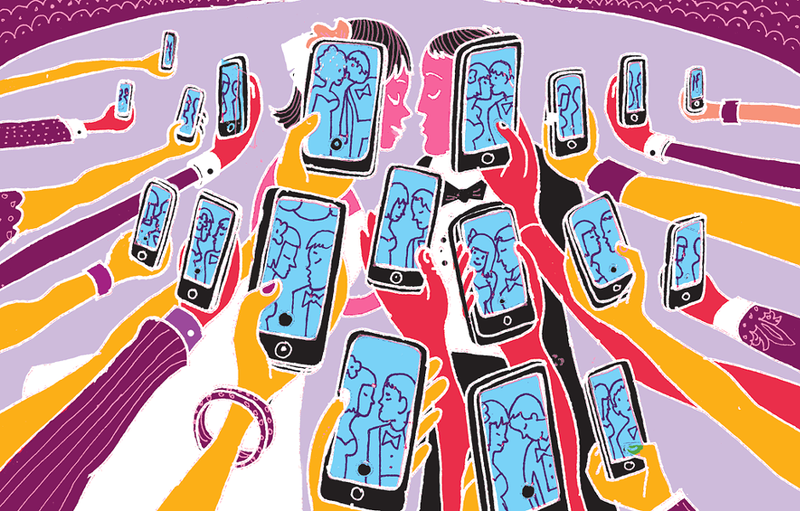 Sure, technology can help make modern nuptials even more fun — and better documented. But how much is too much? When is it better to check that smartphone at the door? SEVEN DAYS: You and your sister, Lizzie, recently put out the sixth edition of Wedding Etiquette. How has modern technology changed the content from the book’s previous volume? ANNA POST: Etiquette is about being aware of how our actions affect those around us, and it’s the same when it comes to how we use technology — is it helping our relationships, or hurting them? The explosion of social media and smartphone (as opposed to cellphone) use both during planning and on the wedding day in the last several years has created all kinds of new questions for couples and guests. How much pinning is OK — and what about using your work computer for wedding planning during business hours? Are wedding hashtags OK? What about emailed wedding invitations? Basically, your goals for planning and hosting your wedding remain the same: Keep the day special, and don’t hurt anyone’s feelings. Technology just adds more layers to navigate while accomplishing that. SD: How have social media affected behavior at weddings (as well as before and after), and what are the issues? AP: Wedding etiquette questions about social media are usually about controlling how and when the day is shared. And it’s not just the sharing; it’s the immediacy of the sharing. This new edition includes both personal best practices and how to guide others’ use of social media on the wedding day. For example, some couples don’t want guests Instagraming photos or tweeting updates during the ceremony. How do you make that request without being a bossy boots? That’s where etiquette comes in. SD: You shared with us that since your engagement announcement last year, you’ve dealt with your own share of social-media frustrations. What have you learned from that experience? AP: I got engaged in early November 2013 while on vacation. My fiancé and I had a short list of close family and friends we wanted to be sure to tell our news to personally. As we started making calls, we realized it would be a good idea to ask people not to say anything about it on Facebook until the weekend. That gave us time to make our calls without having our news scooped — and possibly hurting someone’s feelings. SD: You write in Chapter Four of your book: “The most important thing to remember about email, texts, Facebook posts, tweets, and other social media interactions is that just because you can doesn’t mean you always should.” How might a couple communicate this principle to the wedding guests without sounding like they are policing them? Can they indicate their preferences in their wedding invitations? Is it appropriate to ask guests to check their cellphones at the door, or at least to turn them off? How would you advise wedding guests themselves in regard to using social media before, during or after a wedding? AP: To turn them off, yes. To check them, not unless you’re an A-list celebrity getting married on the down low. SD: Are people sending wedding invitations via Evite now? What do you recommend in regard to using email, electronic messaging or social media to reach guests? AP: Evites can work for pretty much any event that isn’t the wedding ceremony itself. Just be sure to double check that email addresses are up to date, and be aware that every now and then a spam filter prevents delivery. Also, be sure all of the guests use email regularly and would understand how to read and respond to an Evite (think grandparents). Why not for the wedding ceremony? A couple of reasons. First, it’s a physical reminder that gets put on everyone’s fridge. It’s also a keepsake. (Yes, some of us save every wedding invitation we get.) In a mailbox full of bills and junk mail, a heavy paper envelope with pretty writing is a delight to get. Lastly, paper has a gravitas that a computer screen just can’t replicate. Emails and Evites are convenient, but sometimes convenience isn’t the priority. The environment, you say? There are lots of recycled papers and soy-based inks, but if having a paper invitation would really upset you, by all means, don’t. Just be sure to check in with any non-tech-friendly guests by phone or in person. Social media isn’t a great way to reach guests about the wedding, as it’s highly unlikely you’re inviting everyone with whom you’re connected. So that means you’re talking about the wedding to lots of people who aren’t invited, and that’s the wedding equivalent of not bringing enough gum for the whole class. SD: Have you personally witnessed any wedding-etiquette fiascos? If so, what happened? How was the situation handled (or not)? AP: Yes. It involved a bus, an open mic, drunk guests and a very slow bus driver. I will say no more, as I would like to erase that hour from my memory. SD: Have you been a guest at a wedding where the ceremony and reception were technology free? If so, what was that experience like for you? AP: I haven’t; however, I think it would be great. (With obvious exceptions to step out and call babysitters as needed.) People focusing on each other without devices getting in the way — imagine that! SD: Can you explain the concept of an official Twitter ambassador? Who should be selected for the job? AP: This is someone appointed to tweet about the day in a way the couple would approve of and/or so that others can focus on the wedding. I’m not a fan of this concept. Frankly, to whom are you tweeting? All of the people who weren’t invited? Even if a special guest couldn’t make it, tweeting to them isn’t expected. Share the details later instead. Plus, anyone tweeting, including the Twitter ambassador, who is likely a close friend, is pulling themselves away from participating and being fully in the moment. This is the right time to log off and hit the dance floor. SD: What is appropriate or inappropriate to upload on Facebook in terms of photos and announcements, if you are the future newlywed? What if you’re a family member? AP: Let’s go with inappropriate, as appropriate could cover lots. Inappropriate: anything that makes a noninvited person feel excluded from the event. For family members/close friends specifically, I would add any negative comments or scooping of news to the inappropriate list. Instead, check with the couple before sharing news of their wedding planning. Another Vermont Pol Promises Broadband. Could It Work This Time? With an Extra $300K, Can BTV Ignite Make Burlington Techier?